Pomegranate Granita is a super simple dessert to make. It is refreshing, sweet, tart icy dessert and best for those hot summer days.I am addicted to granita's as a afternoon summer treat.This one with pomegranate and a touch of ginger-citrus flavor has a super cooling effect just like an ice cream and you can enjoy without adding the extra calories.Try it,you will surely love it. In a bowl mix in pomegranate juice,lemon juice,sugar and ginger juice. Pour into a shallow freezer dish and freeze for 2 hours. Take it out after two hours and using a fork scrap it so that it does not freeze into one block.Put it back in the freezer and after a couple of hours scrap again into large crystals and scoop into a bowl and serve immediately. looks very tempting ...Lovely clicks.. Healthy dish Suja, How mon's school. I know mama worried more than him. Awesome granitas. You gave a twist in it, very flavorful. Woow!! Lovely granita :) Wish to have some now!! Nice one, you have got a nice color too. Feel like grabbing that super refreshing granita and having now,super beautiful colour. 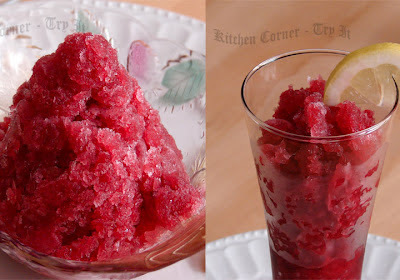 Nice twist to regular granita! Loved the colour..very nice and tempting. Wow, wow look at the lovely color..
Beautiful colour you've got there! Can imagine how refreshing this could be on a hot day! Beautiful color & delicious granita, tempting pics! Love the ruby red colour. Very refreshing. Love ur bowl as well. Very cute.